History was made on a January morning in 1934 when leaders from Alcorn County and a Harvard-educated lawyer from Washington, D.C., who worked for the Tennessee Valley Authority (TVA), met in a back room of the Will McPeters’ furniture store in Corinth, Mississippi. 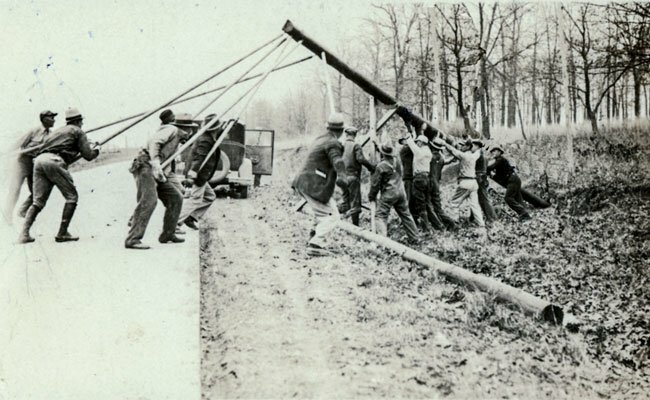 Hence, “The Corinth Experiment” was created in the form of the Alcorn County Electric Power Association, which was a victory for the Tennessee Valley Authority and a keynote of rural electrification in America. In 1932, all the Corinth banks were closed, and the majority of the people did their banking in department stores. The town of Corinth was struggling, and the agricultural-based economy of the county was devastated by the price of cotton, a few cents per pound. By 1933, Tennessee Valley Authority gave Mississippi something to strive toward – a brighter future with hydroelectric power. The newly founded agency was already producing cheap hydroelectric power at the Wilson Dam in Alabama. While rural electricity at this time was unheard of for most Americans, a Corinth banker Ben Liddon and a farmer Delphus (Dee) Crow, Sr. (whose grandson John Lee Crow is employed at Alcorn County Electric Power Association) were interested in improving the economy by bringing power to Alcorn County, where less than one percent of the farms had electricity. The Mississippi Power Company operated a small coal-fired generation plant in Corinth, which served fewer than one hundred families, the majority of which were located within the city limits. The plant was also expensive to operate making its services well above the local farmer’s means. An affordable form of electricity was needed. Tennessee Valley Authority (TVA) desired to bring power to everyone in the valley and offered help to begin a cooperative. The cooperative would consist of a member owned organization where all members would be represented by an elected board of directors, who would govern the organization with policies and procedures. Crow saw the cooperation as a way to bring power to the rural areas of Alcorn County. He knew that he would also need the support of the city of Corinth to bring power to Alcorn County. Liddon knew that the people of the city of Corinth were not happy with their current electrical supplier and felt they would be receptive to an economical form of electricity. Liddon also knew that bringing electricity to the county would not only raise the standard of living, but would bring more businesses to the city of Corinth. Therefore, Liddon organized the first meeting for the perspective first rural cooperation in America. In June of 1934, with a loan from TVA, Alcorn County Electric Power Association (ACE) purchased the current city system of the Mississippi Power Company for $154,000. The Alcorn County Electric Power Association established a board of five men, who would serve without pay, in the capacity of directors for the management of the association. Prior to the purchase, ACE thought the debt would take twenty years to pay, but with good management, ACE was able to pay the debt plus interest within seven years. In 1934, the membership fee was $100 cash, which could be paid in installments. Then in 1939, membership fees began to decrease with the first reduction to $75. In June of 1940, the membership fee was $60; March of 1941 – $40; December of 1941 – $25, and in February of 1943 – $10. All members who had previously paid $100 were refunded $90, and the total refunded to ACE members was $107,436.40. 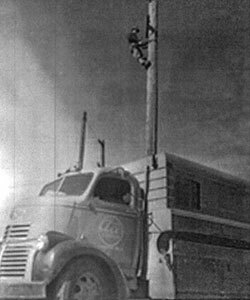 The success of ACE Power Association helped form the Rural Electrification Administration, which was instituted by the Executive Order of President Franklin D. Roosevelt on May 11, 1935. Stories state that President Roosevelt came by train to Corinth, where he investigated the rural electric organization, ACE, to see how the cooperative was conducted and implemented. Unfortunately, change is not always easily accepted by human nature, and the thought of having electrical service in the home was slow to progress in the rural areas of the county. As time passed, these fears soon faded as families saw how electricity could better their lives. Joe Brawner, an employee for Mississippi Power in Corinth who worked for ACE for the first few years of the co-op, recalled how it felt to hook up homes along the first rural line. He stated, “It was the greatest thing in the whole business, bringing electricity to those people. We wired the houses, brought out the appliances, put in the meter, with the families crowded around waiting. When the first switch was turned on, they literally cried and shouted with joy.” Electricity gave these people their first connection to the outside world by means of radio. In the days before electricity, most of the rural homes were two-room wooden shacks. Within ten years, the majority of these rustic shacks were nice brick homes. D. F. Wright went on to become the Manager of Alcorn County Electric Power Association in 1943 and held this position until his retirement in 1975. Wright stated, “People were very skeptical at first, having never heard of an electrical co-op. They didn’t believe we could keep the rates low for very long.” The irony of the story is that the rate of electricity is practically the same now as it was when the co-op was founded, even though today homes have modern appliances that demand more electricity. Who would have known that a sleepy little town in northeast Mississippi would wake up rural communities all over America by forming the first rural electric cooperative? 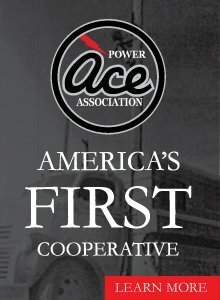 The success story continues as ACE Power Association provides its members with reliable yet affordable electrical service while educating and informing the public on the safe and efficient use of electricity.